The ingredients for this Simple Pot Roast are unremarkable separately but combined, they make a perfectly seasoned beef roast with delicious gravy for your mashed potatoes. My older sister’s pot roast is an unforgettable memory from my childhood. Many times I walked into her house after church, greeted by the smell of this recipe cooking in the oven. M-m-m-m. Now that’s what I call aroma-therapy! This Simple Pot Roast is easy to throw together on a hurried Sunday morning or a lazy Saturday afternoon. 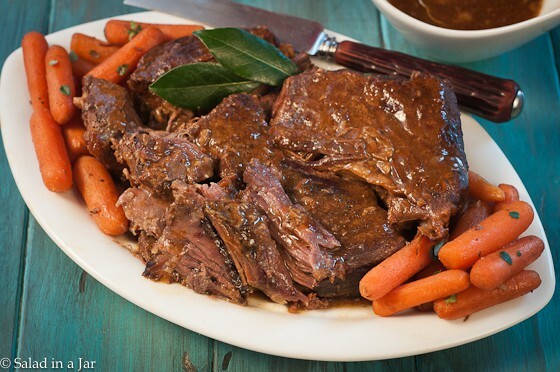 Cook a chuck roast for several hours in the oven with baby carrots on the side. Or use your slow cooker and cook it all day. It will be equally delicious either way. Because this recipe is so simple it doesn’t take a lot of imagination to customize it to your tastes. Maybe the list below will inspire your creative juices. Cut roast into small chunks to make Beef Tips and serve over rice. Substitute red wine or burgundy for some of the water. Use milk instead of water in the gravy. Add thyme, a bay leaf and/or rosemary. Add sliced mushrooms, fresh or canned. A simple pot roast that's perfect for Sunday dinner. Heat oil in large pot and brown roast on both sides at a high temperature. Sprinkle onion over roast. Add beef bouillon, Worcestershire sauce, and pepper. When roast is fork-tender and falling apart, remove from the pan and make gravy with the drippings. Optional: Add quartered, peeled potatoes and whole baby carrots the last hour. Add flour to water and mix well. Add to drippings (if there aren't many drippings, add water until you have at least a cup of broth) and whisk well. Cook on medium-low until thickened. Using milk instead of water will make a lighter-colored gravy with a slightly richer taste. Make this in the slow cooker if you prefer. Follow directions through step 3. Put roast in your slow cooker before step 4. Cook for 8-10 hours on SLOW. Great recipe! First meal I ever made…and made it again for friends a few weeks ago–still fabulous! Thanks, Paula! Really love your site! I’ve never made a pot roast and this looks delish! Question…I don’t understand, in step 4, what is meant by “Pour water around edge of pan.” How is this done Thanks! I’ve also been through with a period of no tv but unlike what the other had says here I love it. I love the comfort that it offers like complete rest without any disturbing noise coming from the television, completely no destructive news and get to savor life away from the civilization. It’s the total package of peace. I bet you to try it for some time. The photo of this pot roast looks so good and I’m sure the smell is aroma therapy. I think that is great that you grew up that way, it does make the imagination grow too. I recently learned how to play scrabble about 3 years ago…isn’t that crazy? I love words with friends too. We had TV when I was growing up, but it was black and white and simply not that interesting. (Not to mention the fact that you could only get a couple of stations, and that was on a good day.) I remember playing dominoes and scrabble, and having lots of outdoor time. (I have to admit that I too am addicted to Words With Friends.) It’s fun to reminisce. 🙂 That pot roast looks really tasty! Ha! Love that you called this recipe aroma therapy. The pot roast looks delicious. I’m not familiar with Words with Friends but my husband plays Scrabble on his iPad and loves it. That sounds so good! I’ve taken to using my slow cooker for my pot roast and discovered quite the revelation: perfectly ‘roasted’ carrots! Now that’s the only way I cook carrots! How fun Paula to hear about your childhood – sounds like special memories to me! That scrabble is probably part of why you’re such a good writer too! The pot roast looks amazing and definitely like something delicious my mom would have made! Also looks like the leftovers would make fabulous soup! Sometimes I make a pot roast just for the leftovers! We did have a TV when I was growing up, but the rural area where I lived only received 2 channels on a regular basis and PBS if the wind blew the antenna just right. We also had only a black and white set until I was in junior high (early 80s). I read A LOT, and tried to get my sister to play Scrabble, but she wasn’t that into it. I was incredibly jealous of my classmates with cable TV and endless programming. Now, Hubs and I have a satellite and our own endless selection, and I am back to reading (or surfing the net) more than watching. Everything that was always comes back, I guess…except that black and white set. I hope. Pot roast is a favorite comfort food for us, too. I also have memories of coming home from church to the beefy aroma filling the house. Delish. Will have to try your version next time I take this walk down memory lane. Thanks for sharing. we went through fairly long period with no tv too and I hated it so much. Especially when I failed a homework assignment to track how many minutes of programming versus commercials were in our favorite show (teacher didn’t believe me when I siad we didn’t have a tv). But now we’re glued to the damn thing every night and I kind of wish we didn’t have one…. I’m not the biggest fan of post roast, but hubby loves it. I should probabaly make it for him one of these days. Lauren, I hated it too. The only thing that saved me was watching it occasionally at Grandma’s house which was within walking distance. Would you believe my parents got a television as soon as my youngest sister left the house and now my 94-yr-old mom watches much more TV than I do. Personally, I’m a radio freak because of it and you will find it on in my house most of the time. Kay’s Pot Roast looks just perfect and I can imagine the warm, comforting aroma it gives off! I like the open-dictionary Scrabble variation. Sweet family memories!